We're settling in and hitting our stride here in Chester, VT. We started our day in South Londonderry after sleeping overnight at the Town Hall. After breakfast and kids club orientation we walked down to the town hall and went to church at First Baptist Church of South Londonderry. It's so great to be able to worship in the new First Baptist building and it's good for our students to experience a church service a little different then there's back home. After service we spent the next couple of hours relocating from South Londonderry to our home for the week in Chester. We moved all of our food and home base supplies as well as the mattresses and our luggage this afternoon before sneaking away to a beautiful place called Stoughton Pond for a late afternoon swim! 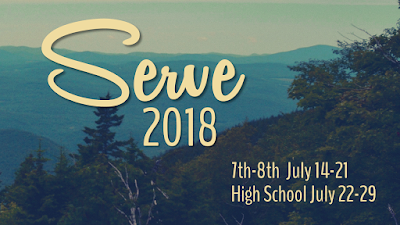 On top of that we're joined by the Desilets Family and the Blackey family for dinner every night and tomorrow starts SERVE Preview for 5 fifth and sixth grade students from Vermont. Our evening programs have started incredibly. Daniel Vallette is leading us in worship this week and different speakers are sharing each night. Tim Desilets (me) kicked us off last night with a message about the heart of service and the importance of understanding that people are more important than projects and understand God's love for us helps us fill our love tanks in order to love the people around us. Mandy Desilets shared tonight about our heads and she used the story of Gideon to talk about God's not looking for heroes and not looking for people that want to do something specific or serve a specific way but just want to be used by Him in whatever way He sees fit. The end of our nights are always capped off by small groups as students process the message they just heard with our amazing leaders and each other. I love walking around as groups meet listening to excited conversation and comments about the things they just heard. The buildings are now quiet with the guys sleeping here at the Baptist Church and the girls just up the street at the Congregational Church. It was a hot day and a hotter one tomorrow but the night air is cool and should make for a great night of sleep. We start at 7:30 with breakfast and take a running leap into the morning with service project vans leaving at 8:30. We'll have groups at VBS, The Collaborative, Londonderry Parks, and Abundance Acres Farm tomorrow. I'll make sure to update where each of the students is working tomorrow. Hopefully with some incredible pictures. In the meantime enjoy the pictures from today - I'm sure there will be even more tomorrow!